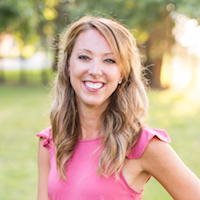 Week 1 Bathroom Remodel | How to Demo a Bathroom - Sincerely, Sara D.
This bathroom remodel is happening thanks to a 6 week renovation challenge with Jeffrey Court. The space is shared between my daughter and any overnight guests we may have. Although the bathroom is not in terrible shape, it is boring and has the same cheap tile found throughout our home – big 12×12 squares with grout that was once white (and is now a gross brown). My mission is to slowly remove this tile from our home. It shows EVERYTHING, and I think it looks industrial, and is not something I want in my home. 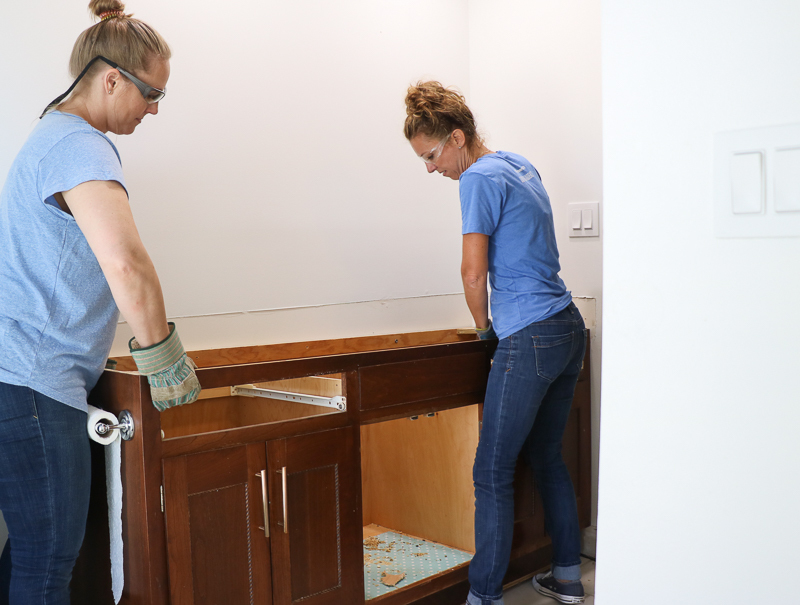 My amazing friend Angela from Unexpected Elegance came over one morning, and together we began demo by removing the vanity and the toilet. Turn off the water and unhook the water lines under the sink. 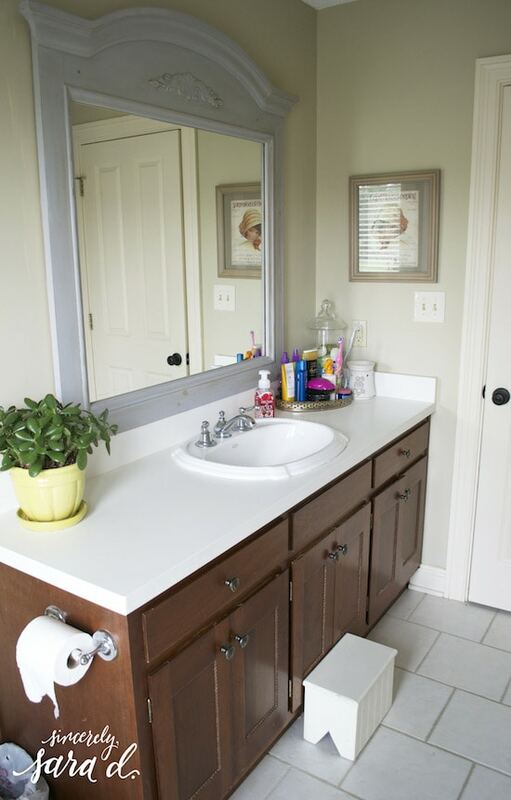 Remove the top of the vanity if possible. First check to see if any screws are holding down the top then use a razor to cut the caulk running between the counter and the wall. 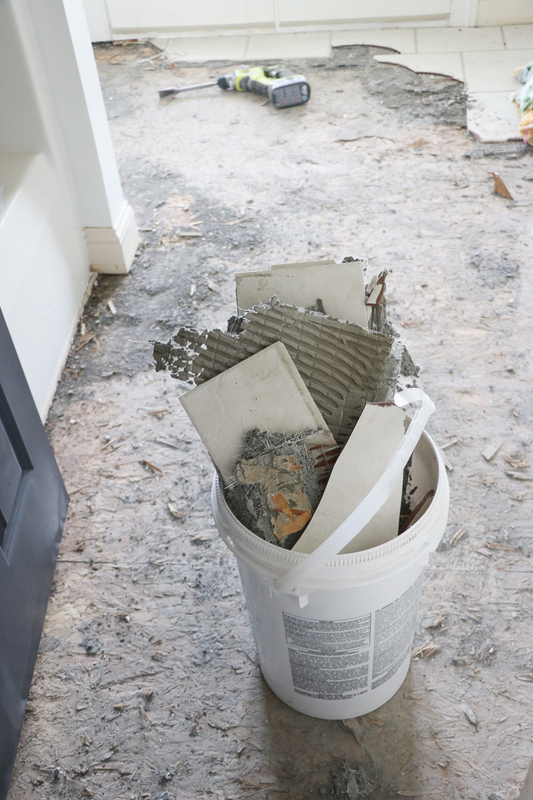 This will help from dry wall damage. Once this is done, you should be able to pull the vanity up or out from the water lines. 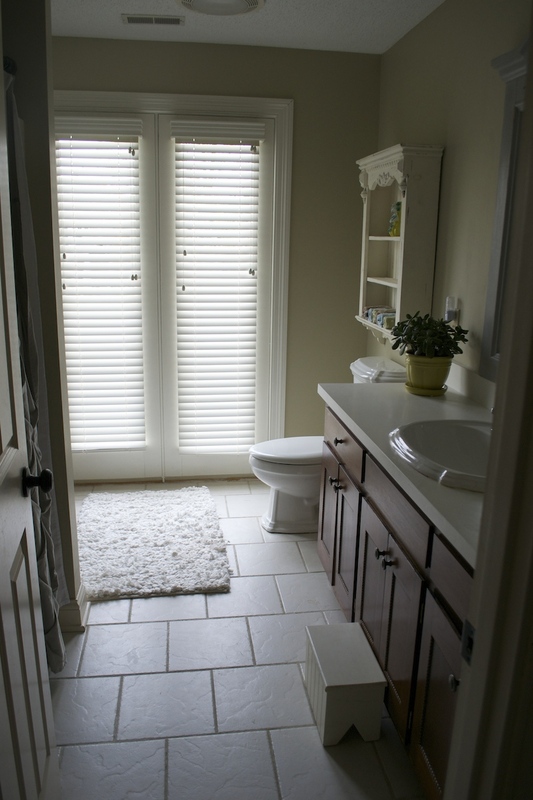 Flush the toilet to remove as much of the water as possible from the toilet and basin. Use a cup to remove any extra that won’t flush. Remove the water line from the toilet. Remove the caps from the toilet base and remove the washers holding the toilet in place. Simply lift the toilet up off the wax ring. It is helpful to have a large trash bag to lift the toilet in to to help from water getting everywhere – especially when you carry the toilet out of the home. 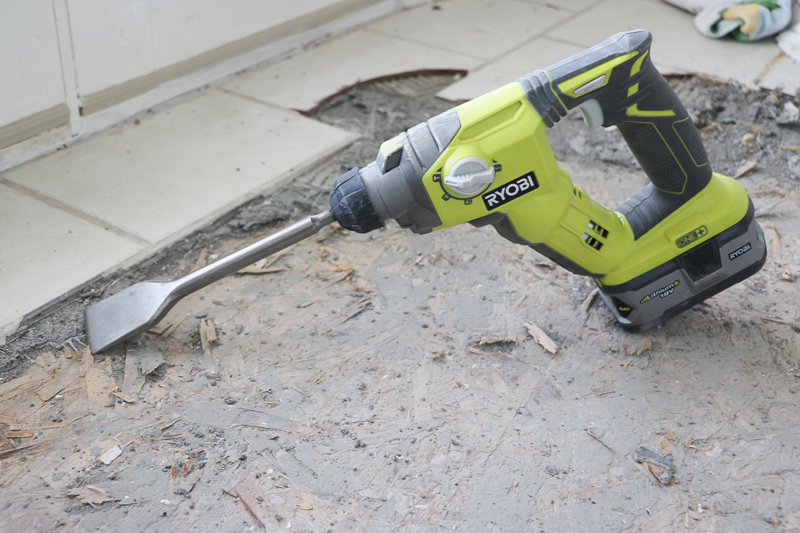 I used the RYOBI Hammer Drill to remove the existing tile, and I was so amazed how strong this battery-powered hammer drill is! 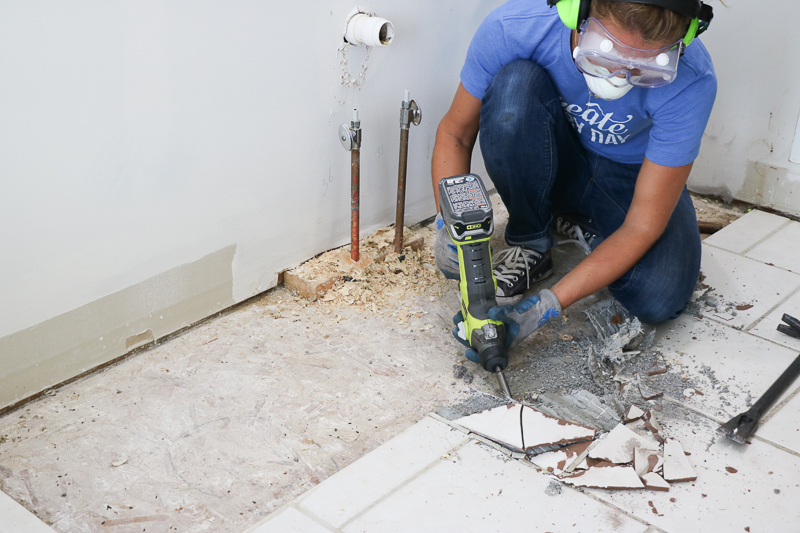 I was able to demo the entire bathroom tile on my own with this tool. Since the bathroom is upstairs, I removed the tiles by the bucket. I had a few trashcans in my garage I filled with the tile. Then we borrowed a truck and took all the debri to the dump. We learned while remodeling our kitchen that it is SO much cheaper to take trash to the dump. We can take up to a ton of waste for $25 to the dump compared to hundreds of dollars for renting a dumpster. Find a friend with a truck, and make trips to the dump on your own! After the tile is removed, the nails (or screws) need to be taken out. 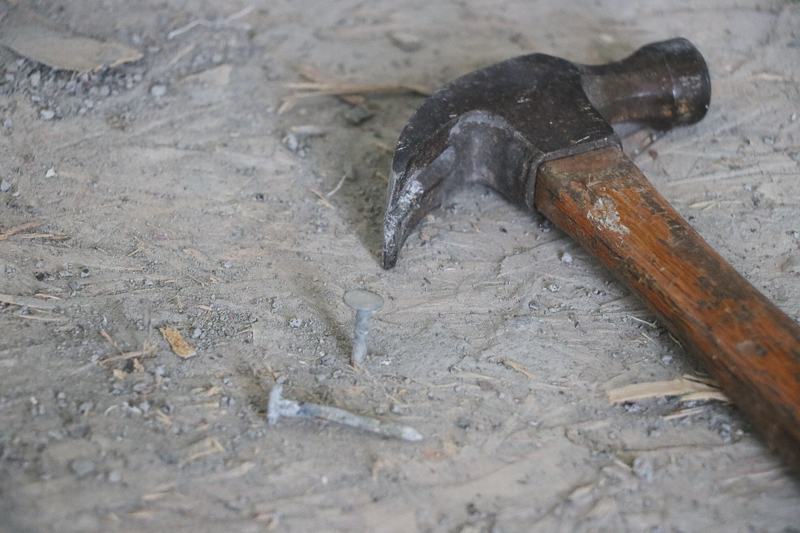 Once the nails/screws are removed, clean the floors as much as possible. 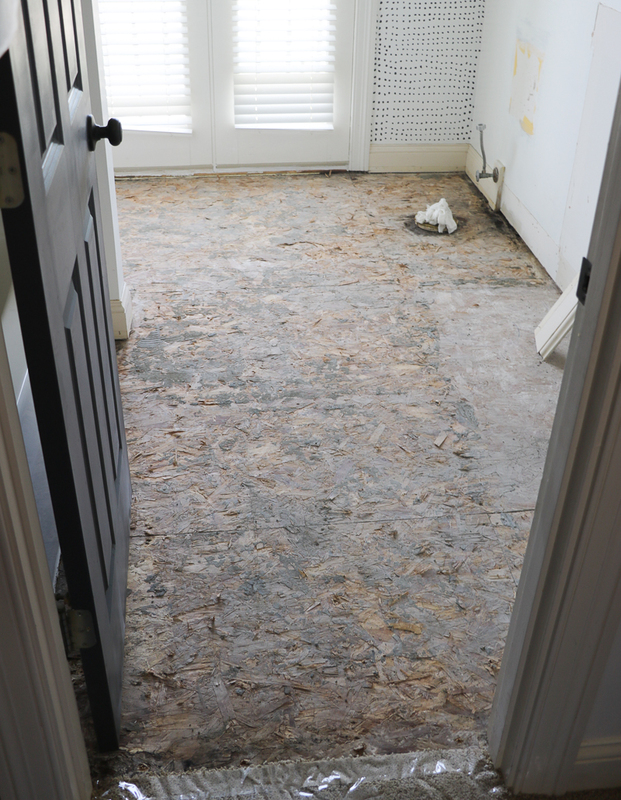 Once the debris is cleaned, remove all the trim/baseboards. 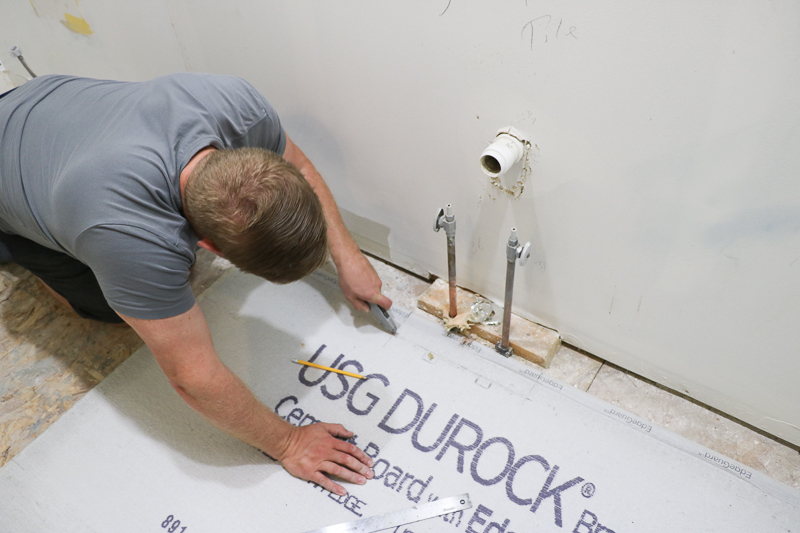 We have now begun the first step of the remodel post demo, and Steve jumped in this time to help me dry fit the cement board (my arms were tired from all that tile demo and I was having trouble cutting the board)! Not too long ago, we remodeled our kitchen. 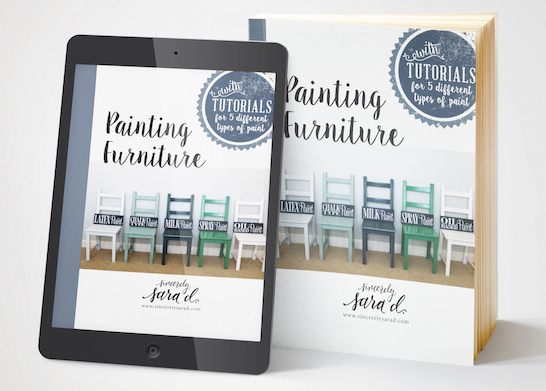 To read a little bit about that kitchen demo process, go HERE. This post is sponsored by Jeffrey Court and RYOBI. All thoughts and opinions are my own.